Hello Everyone! September is finally upon us, which means Fall Fashion! 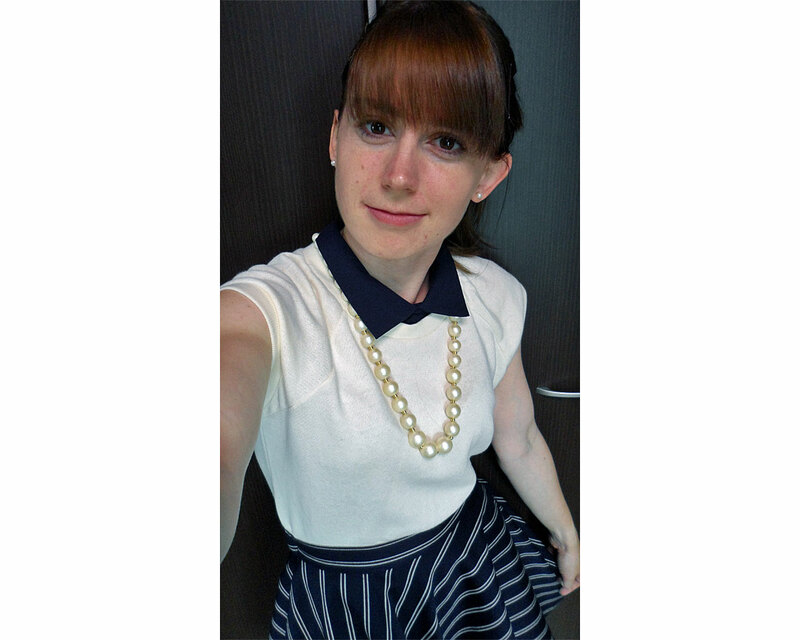 This year there are so many nice trends in Japan, but I am starting out with one in particular that seems to be one of the more popular which is the The “British” trend; Stripes and Collars and Vintage style Midi-like skirts. 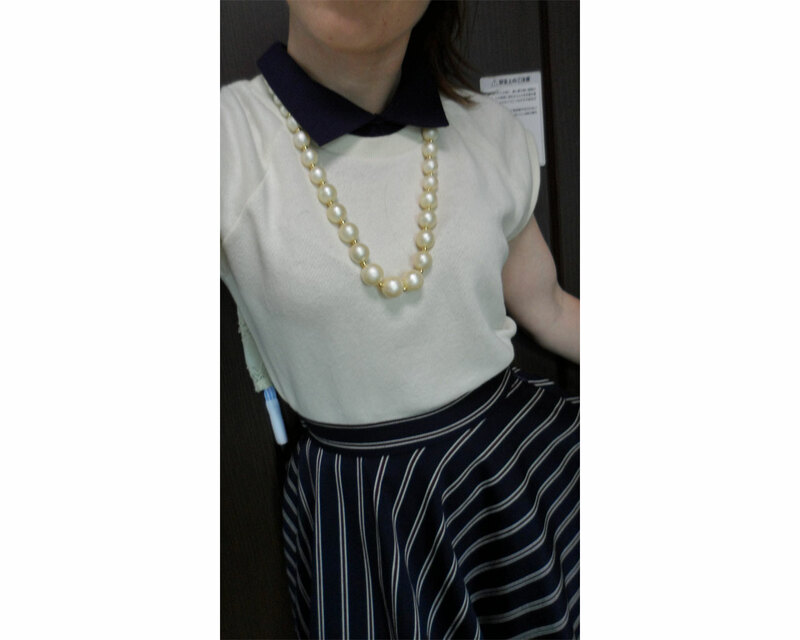 This outfit is a Short sleeved collared top that is a sweat-type of material, paired with a striped vintage-like midi skirt topped off with a set of cotton pearls. 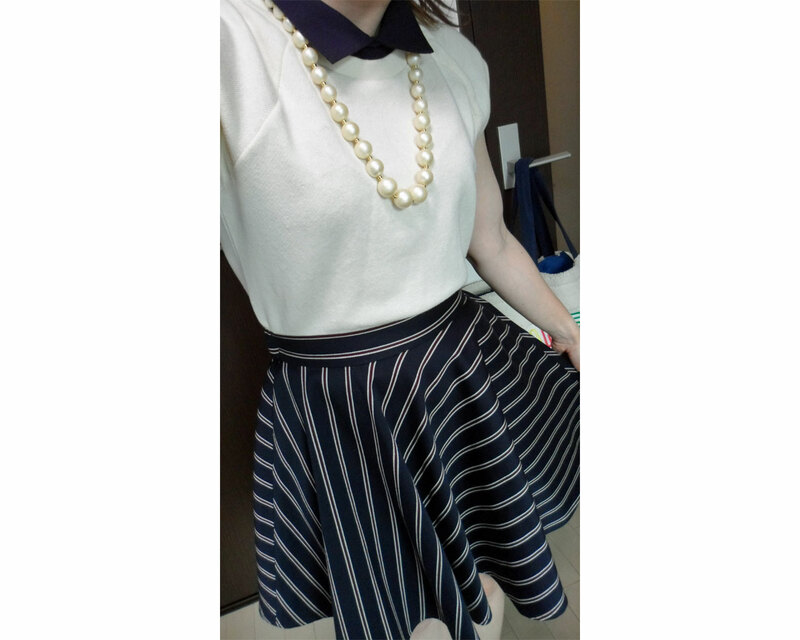 I love navy blue and white, as well as red as an accent in the stripes of the skirt. This whole Outfit is from the brand Noela, that is one of my favorite brands in Japan! I love collars on shirts, so I liked this shirt a lot! I also liked how the top was a sweat type of material that can be transitioned to wear during the winter you can layer a heat-teck shirt from Uniqlo under it to still wear it. The cotton pearls are so beautiful! Pearls are a trend that I love this season (Never goes out of style in my opinion though!) The cool part of this necklace is that it actually has more to it than it looks, it has a second strand that you can attach to it, as well as bow that you can take off and on and coordinate it any way you like! Next up is the Midi-skirt! I love the stripped pattern on it, as it give is a bit of an a-symmetrical feel to it while walking. Now, many of you may be wondering why I decided to get a midi skirt when I am short (only 4-’11 or 150cm) Well, this skirt isn’t as long as the other midi-skirts that I had been looking at, landing at just above my knees, and I wanted to go for that vintage look this season. As I said before, I love the red accent of the stripes. I am not a fan of red by itself, but in stripes as an accent I love it and it give it a pop of color. I would wear a pair of navy or brown loafers with this during the fall and then a pair of heeled boots and tights with it during the winter when it gets colder. If you would like to check out the store that I bought these clothes from, please see the websites below! They only sell and ship inside of Japan. I hope you enjoyed this blog post! I love the fashion this season and I hope that you do too! Please let me know what you think in the comments below! Quite a nice and stylish outfit ! 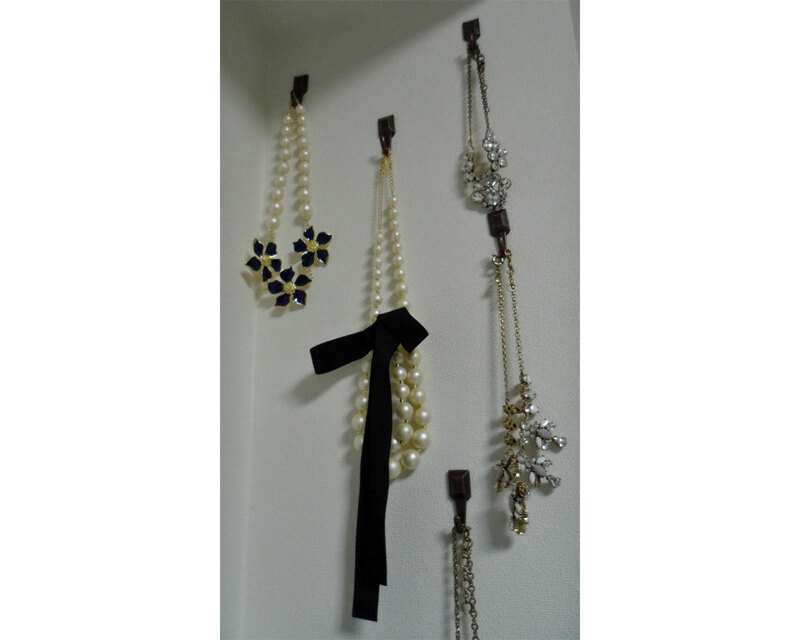 The pearl necklace is really cool. I used to wear long pearl necklaces before. This outfit would totally fit my sister. She has a similar fashion style than you ! I’m not sure if I could wear that myself. My fashion is a little bit massuish, love patterns, retro, colorfull, cutely kind of fashion. Really like your outfit thought ! It’s really classy !! As pretty as your outfit is, your hair really tops it off. Very cool cut!